Mineral foundations can be found almost anywhere these days, from drugstores to department stores. Many of us converted to mineral foundation under claims of it being safer and more gentle, but not all mineral foundations are created equal. Price is no way to tell which foundations are safe. Vegan-friendly budget line E.L.F. decided to create their own Mineral Foundation. How does it compare to the competition? The ingredients in this E.L.F. foundation are very similar to one of the most ubiquitous mineral lines. People who suffer allergies to that line, specifically due to the use of bismuth, will find that same ingredient in this E.L.F. foundation. However, the formula still appears to be gentle for most people, as it came out at a low 2 on the EWG Skin Deep database. Oddly, there was another version of this product with a different ingredient list that rated much higher, but I used the current list from the E.L.F. website, which matched what was on my packaging. Regarding performance, this is a fairly light formula that goes on sheer and can be built for heavier coverage. 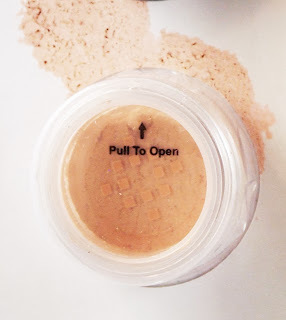 It is a loose powder, so it will shift around during travel and can sometimes get a bit messy. The powder tends to disappear after a few hours, so I recommend using a primer and a finishing powder as well for longer wear. When I first ordered this foundation, the color range was much smaller; I was glad to see it has expanded into a decent selection of shades, now. If you tend to like most mineral foundations are are looking for a more affordable option, I recommend trying this one by E.L.F.